The new year has brought with it the end of bowhunting until next year, so I've gone back and reviewed some of the data from the log I kept throughout the '17 whitetail season. 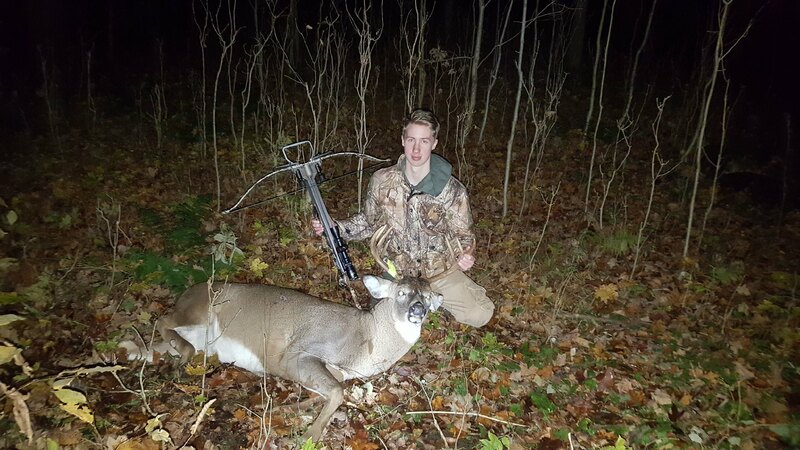 2016 was my first year hunting having taken up archery that same year, and as I realize now I was very lucky to harvest a nice late season 8 pointer just before Christmas. It was the only deer I saw that year, and I put a significant amount of time in determined to be successful. That season I was hunting some regional forests in 77b. Fast forward to 2017 I hunted 3 different properties 2 private, 1 public. Despite failing to harvest anything, I still deem this season a success in it's own right. I learned quite a bit this year, not only about hunting but about family as well becoming a father in late November. -Over the course of 27 sits a total of 21 deer were seen (21x the amount seen in '16). -I found no correlation to moon phases, biggest connections to movement were by far weather fronts and barometric pressure. -Of those 21 sightings only one buck was seen. -Does are very wary creatures, I was blown at on many occasions some of which were baffling ie. coming in from down wind and then blowing once out of range upwind. - And finally; be nice to those that you share the bush with, after all they are fellow enthusiasts and could be there to help you should you need it. All in all it was a really fun year, many lessons were learned. Thanks to my wife for putting up with the obsession that it became. I am already looking forward to a year of scouting, practicing with some upgraded equipment, and applying the lessons learned to a future season of perhaps hunting smarter and not harder. That's a wrap on '17, how was your season? From most everybody I talked to up my way and even over in Collingwood, lots of sign of coyotes,very little sign of daylight deer,for sure not a stellar year. Seeing as this is the bow forum I will only speak to the deer hunt as the bear hunting this year was done by rifle. I went out perhaps a dozen times not including the rifle hunt and saw at least 24 different does and 5 different bucks. The bulk of these were on a highly productive property in 81b. Two of the bucks and 6 of the does were at my camp in 82a. My son and I (myself while party hunting on my other son's tag) both took really nice bucks off of the 81b property. Others that i know took 2 decent bucks and a doe off our camp property in 82a. As for getting busted - I seem to have the scent thing relatively down as I don't think I was ever winded. Movement on the other hand seems to by my issue. A number of times the deer would spot movement on my part than stop whatever they doing and stare at me stomping their feet for several minutes. Sometimes I would get lucky and they would calm down other times they would slowly decide to go back the way they came. Last edited by Species8472; January 4th, 2018 at 04:50 PM. With regards to the scent stuff, I do as much as I can with the body wash/shampoo and odorless laundry detergent. On some of the late season hunts I was bundling up and adding some layers that were not part of my usual hunting attire so scent might be the culprit in that case. Also this year I felt like the controlled hunt occupied the best part of the rut, so despite this being the bowhunting section I think I will try to acquire a controlled tag next year. We had good activity and sightings early in the season. On my first 4 sits, I saw deer each time passing on 2 shot opportunities. I had my eye on a Buck Ive been calling Drooly that ive been getting on my cams for the last few seasons. I only saw him on the hoof once and it was when I was checking a stand after my morning sit. He had bedded down almost directly underneath the stand...and I spooked him out of there faster than you can say Jack Robinson. Havent seen him since and I have not had a pic of him on any of our cams since October. I have a hunch he was killed during the controlled. I found the activity totally shut off around the 20th of October, which I find to be normal for the areas we hunt. Things picked up again in our area in November, with roughly November 10th-13th having the most activity in terms of bucks chasing does. With the respect to the photoperiod in mid November,.I think we got that cold front at the most ideal time..which hasnt been the case in years past. I was not able to get out much at all for the 2nd half of November, and I found that come December the daylight movement almost completely shut off. Which is incredible because I have always found that the deer are still moving at dusk and dawn...but our cams had next to no pics of daylight deer even over top of the food plots. The extreme cold at the end of December got the deer in daylight again over food sources. I started putting my time again for the last 1.5 hours of daylight during December 22nd - 29th and fortunately filled my tag on 29th. It was an interesting season and for the most part a good one for my friends. The weather cooperated for us, a lot of crops stayed standing until after the controlled (which works for me a bowhunter , and most importantly Im lucky enough to have some meat in the freezer which will be shared with my family, landowners and my friends. The biggest thing I learned: The obsession is real, and it gets worse every year lol. Ted, one of the properties I hunted/ran a camera at was in 79C. A very small plot, but borders a bean field and has a creek running through it. Felt very optimistic about it. Had the camera running from mid September throughout the season there and from that whole time I had two pictures of deer on the camera in day light. There were a lot of deer passing throughout the night. I kept the pressure low only having hunted that parcel maybe 5 or 6 times. I had a really nice 10pt on camera at two different times on Nov. 24th and I think he was roaming outside his typical range at the tail end of the rut looking for love. A highlight from this was season was for the first time ever I had back to back sits with sightings, which surged my confidence. Unfortunately that was followed by a long drought with no activity from end of November until the extreme cold around Christmas when the movement picked back up. The obsession to be out there got worse as the days clicked by. To bring it full circle, in the first hour of the season opening I was at full draw on a doe with her fawn and didn't shoot. While part of me thinks I should have let an arrow fly to save me some of the anguish of the -29°C sits over the holidays, I chalked it up to representing some kind of growth as a hunter. Hopefully all the does were successfully bred, and there will be that many more deer to hunt next year! Good observations. I bow hunt in Michigan for Doe's mostly. Made 2 bow hunting trips there. Took a nice doe opening day 30min in to my hunt. Trip #2 had a nice big doe come in. She saw me move in to position & took off. That was about it for my bow hunting. Opening week of bow season for deer was good for sightings, in the second week daylight action slowed down a bit but then picked up around the last week in October. Thats in 79 and 87. Overall, deer and turkey sightings increased over last year, with fewer yote sightings. 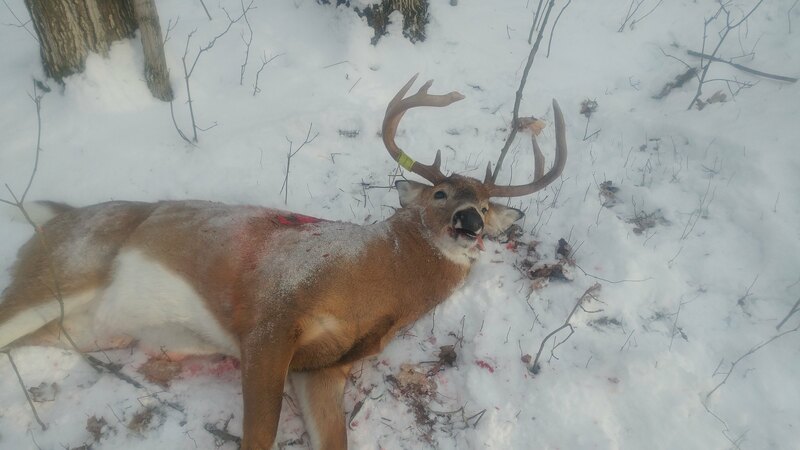 i harvested my Deer Nov. 3rd , 2 days before gun season (with about 8 total deer encounters prior) and i didn't see another deer during daylight hours after. i hunted different properties (all public) after for 1.5 months to fill my doe tag and maybe those were areas where their daily activity was only nocturnal but i did find it interesting that even though it was snowy and very cold, it didn't increase my daylight sightings. you keep a very detailed journal it sounds like, i need to start doing that. i am embarrassed to admit i just finished my fifth season with still not shooting a deer. This was the season I put in the most effort, and had the best spot yet (except for spots shared by buddies in the past), but still didn't make it happen. unfortunately i think i put all my eggs in one basket and over-pressured my spot, it didnt help that the farmers dog started following me around the property (luckily they kept him inside after i saved him from being hit by a car in mid-november), because by the end of October I was only getting nocturnal pictures. the only daylight shots i got after that time were during the peak rut just before, during and after the November gun hunt. I had a controlled tag but decided this property was not safe enough, due to proximity to houses. The only time i could have got out during the "peak rut" my wife screwed up her schedule (and had just returned to work after maternity leave), and i was unable to get out, only to find tons of daylight pictures of bucks and does, and several nightime pics of a massive buck during that time. the late season brought some renewed action on camera (at night though), with tons of does and a few bucks on camera in the cornfield, so i setup a pop up blind to hunt this area, which worked with the changing winds that came with the cold weather. I sat a bunch of times, with standing corn and after it was cut, with no action, and only pics at night of up to 6 does and a few random bucks, including one large one. reduce pressure by getting more properties, this small piece of bush is connected to hundreds more acres spanning a few concessions, scattered with houses and farms. I need to see about getting permission, and even use my farmers name to gain access to more bush and not over pressure them. I also will be more comfortable hunting with a shotgun if i can just get a bit further from the houses and people. it is a very high pressured area though, and one property nearby I hunt for turkeys has two separate groups hunting it for deer already (i didnt even bother asking for deer permission). I have a feeling this will be common in the rest of the area, but i wont know until i try. I also feel that the knowledge i gained this year of this property, and deer hunting in general, will help me hunt and scout better next year, and put less pressure on the property scouting and checking cams. But i will have to start fresh on any new properties i acquire. Keep the bait going. I setup bait just before the season, which had some action, but i let it run out and rarely refilled it until late season. I need to keep a nice pile of corn, carrots and apples somewhere on the property to make sure to keep some does around and therefore attract more bucks, which should mean more action during the day. get a real treestand. i used a homemade treestand thats only 10' tall, and wasnt covered very well, it was located amongst several pretty busy deer trails, however i think i was too exposed and too low, and they could see me moving from a mile away, not to mention any swirling winds would carry my scent around easier. I also used a homemade natural blind, which i need to improve, and a pop up blind, which i could use a new one... money has been tight the last few years, with 2 new babies, and a wife taking two maternity leaves in two years. Hopefully the hunting budget can handle some more deer gear next year (say that ten times fast). Control movement better. I am a very fidgety person, i am sure there were deer around when i hunted (just by the shear number on camera), and i am sure i was spotted being twitchy and moving around before i even saw them. I am working on getting back in shape right now, and i feel that this will make me more comfortable sitting in uncomfortable places, and will allow me to hold up my bow when I need to, not to mention more stealthy movements while going too and from the stand. Anyways thanks for reading, if you actually got through all that. Writing this out has been really good for me to think through all these things. Next year I am making it happen and filling my freezer!! I also may get invited to a camp for the November hunt, and these guys do really well, so I am crossing my fingers on that. good luck to anyone still pursuing rabbits or coyotes!! next weekend is duck box maintenance time, with a nice rabbit hunt planned. My name is BOWJ..... and I am a waterfowl addict!